In March 2011 a graphic video surfaced on YouTube that depicted what was claimed to be the killing of at least six women by Ivorian security forces (FDS) during a protest in Abobo. The demonstration occurred during a period of unrest when President Laurent Gbagbo clung to power after his defeat in presidential elections the previous November. 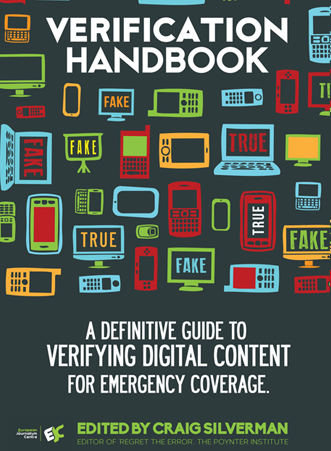 At the behest of a client, Storyful set about verifying the video two years after it happened. The video shows a large group of women chanting “ADO” (a reference to Alassane Dramane Ouattara, Gbagbo’s rival). Then, at the 3:32 mark, armored personnel carriers come into view and large-caliber rounds are fired. Several people appear to be fatally wounded. 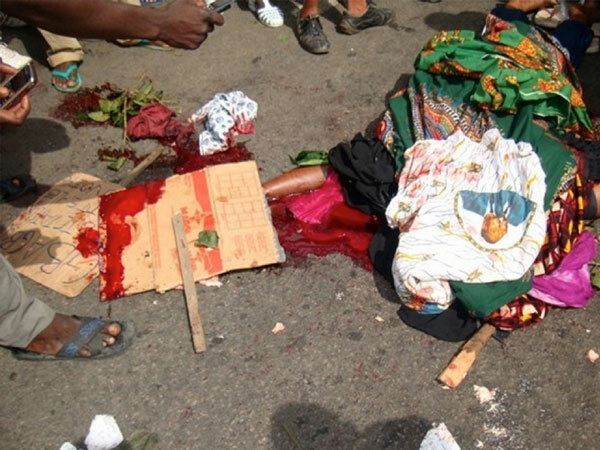 At the time, some Ivorians claimed the injuries were staged. The country’s then defense minister cast doubt over the video and Gbagbo supporters claimed the video was a “fake” in YouTube reconstructions (here and here). 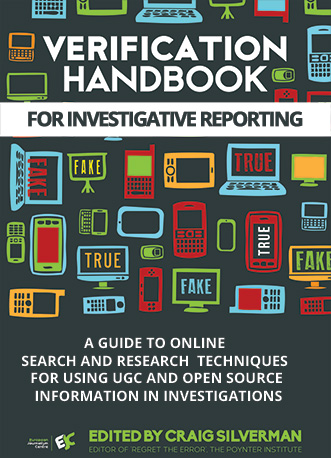 Verifying video in a breaking news scenario is in some respects easier than this form of retrospective investigation. 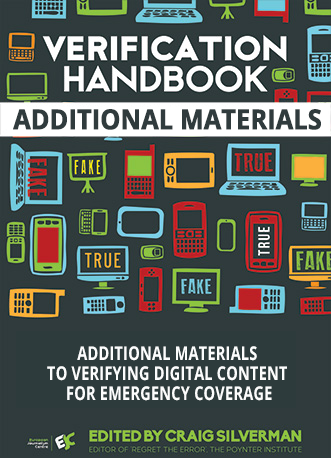 Information that corroborates or debunks a video is more accessible in the recent timeframe; information related to an older event is often hidden deep within social networks. Archival search is either challenging or not possible. With those limitations in mind, here’s how I worked to try to verify the video. Unfamiliar with the details of the reported massacre, I searched Google for "Women killed Gbagbo March 3 2011.” This returned several reports (here and here and here) describing the approximate location and the sequence of events. This search also returned a statement about the event made by the country’s then defense minister, who claimed the scenes were staged. According to reports, the demonstration and shooting happened at a roundabout in the vicinity of Abobo, a northern district of Abidjan. Specifically, one report located it at a major junction/roundabout on Autoroute d’Abobo, adjacent to the area known as Abobo Gare. A witness in the report described the security forces passing by a roundabout, doubling back and opening fire on the women “before heading back to Adjamé.” Adjamé lies south of Abobo, giving us a lead on the direction of traffic. 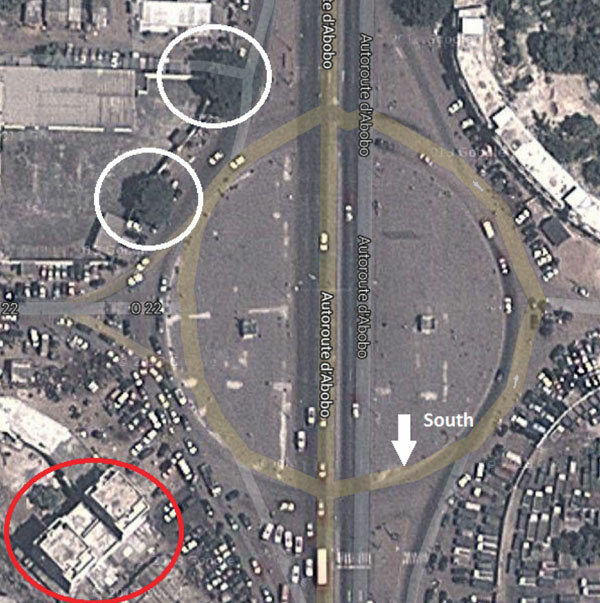 According to a contemporaneous report published in Le Patriot on March 8, demonstrators gathered “at the roundabout intersection of Banco” (mapped below). Searching a local forum shows that the roundabout was the site of previous such demonstrations. Google Maps shows two major roundabouts. 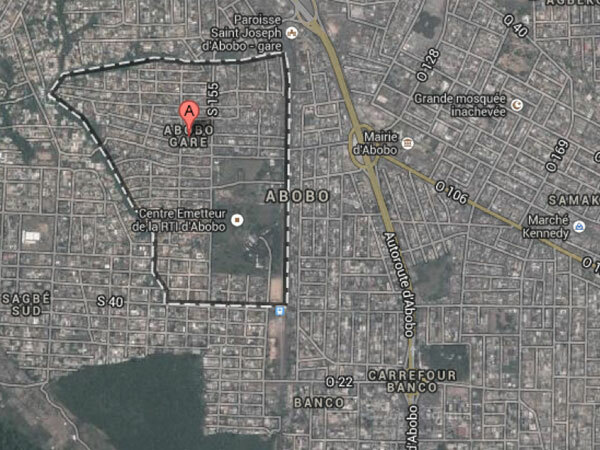 One of them, Carrefour Banco, lies at the southern end of Abobo, toward Adjamé. This fit with the previous report, so I used it as my starting point. 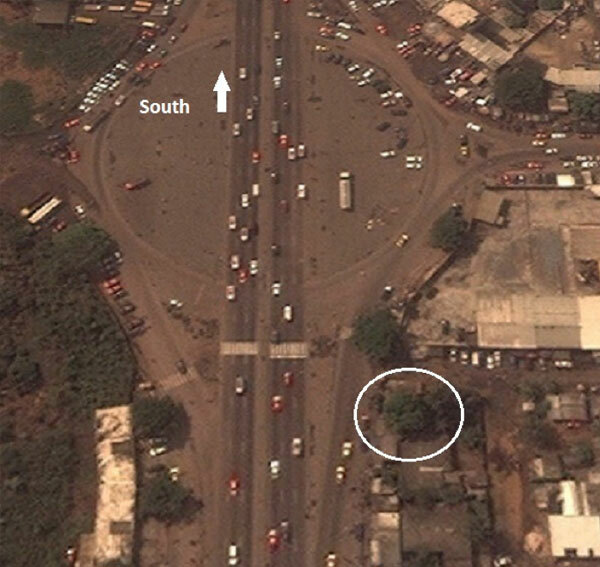 The position of street lights and traffic lights, the alignment of palm trees and deciduous trees filmed in the video from 4:00 onward line up with the satellite view of Banco Carrefour’s north-western corner, as shown in the above white circles. 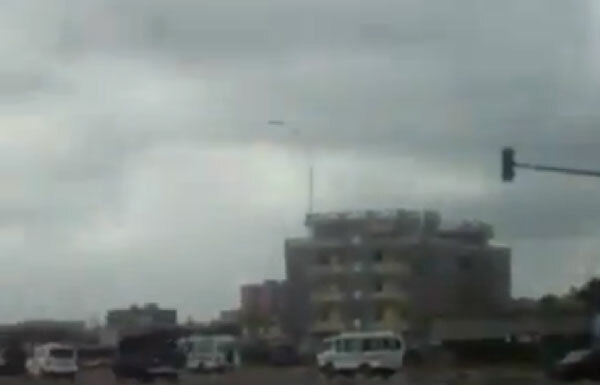 The large building with two prominent protrusions atop the roof (circled in red) also aligns with a building we see in the distance as the convoy of security vehicles disappears from view. This matches the direction of traffic evident in the satellite image above, and the account given by an eyewitness of the vehicles driving south toward Adjamé. One piece of video evidence (above), however, did not match the satellite imagery. We counted three large deciduous trees as the convoy entered the roundabout; Google Maps shows just two such trees. The video was filmed in 2011 and the satellite images were dated 2013, so perhaps a tree was cut down. So we looked through historic satellite images on Google Earth. Images from 2009 show three large deciduous trees stood at this corner of the roundabout. The third, missing tree from the 2013 satellite imagery is outlined in the below image. (It has been flipped 180 degrees from north to south). Judging by this view, we can see that the camera position was directly across the road. I later spoke with a reputable source known to Storyful who is familiar with the video, and who had visited Abobo to report on the “massacre.” The source confirmed this was the camera angle. The date of the shooting is corroborated by several independent reports and videos shared on social media. These are found retrospectively through a variety of searches: on Twitter, on Topsy or Topsy Pro (which allows a date range to be set), and on YouTube with results ordered by upload date. I used historical Twitter search to generate leads by scrolling back to results from March 3, 2011, onwards. I examined Tweets and questions about the event and found this and this reply. These sources are potential witnesses, or people who could identify witnesses. The first source lists her location as Cocody, Abidjan, and the second one as Abidjan. I also located this person, who uploaded video from Abobo and previous RHDP rallies. Checking other Twitvids on his account leads to a video uploaded on the day of the protest. I looked further at his Twitter timeline and found other references to RHDP on that day. That led me to other links, such as this news report of the event. It included a photo credited to Reuters that showed victims matching those in our video. Running a Google Image Search on the photo confirmed it wasn’t used prior to March 3. However, the results also show that a Guardian article credited AFP/Getty Images and not Reuters. This meant a credible photographer was on the ground at the event. I dug further into the photo, shown below. The image is consistent with the picture of the victim at 5:30 in the lead video. 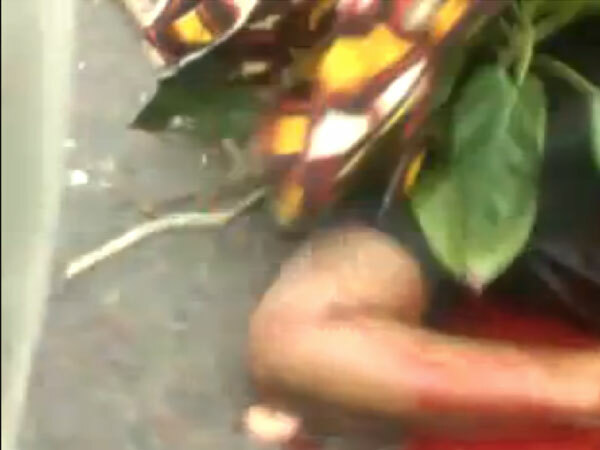 The victim is covered by garments and green leaves used by many of the demonstrators. 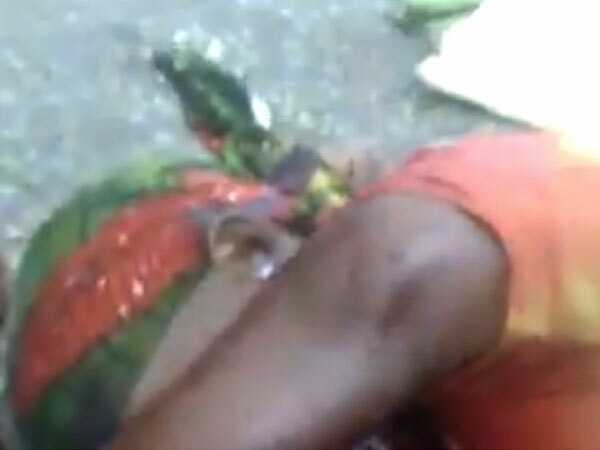 Note the tight, dark blue T-shirt worn by the victim and the distinctive garment with a square pattern of red, orange, white and dark lines, shown below in a close-up. France 24 Observateurs was also provided with photos from the event by sources in Abidjan. We at Storyful confirmed this with France 24. Other searches uncovered a photo-diary published here by an Agence France-Presse journalist, Issouf Sanogo. Sanogo interviewed a woman named Sirah Drane, who says she helped organize the demonstration on March 3. Drane says she was holding a megaphone to address the large crowd that had gathered at a traffic circle in Abobo. A woman matching this description is seen in the video. The video correlates with three other videos of the event. These videos were documented by Storyful at the time, and could be found by searching YouTube using search terms identified earlier. The first video was uploaded on the day of the shooting to an Ivory Coast-registered YouTube account which was created specifically to upload the video. There is no further activity on the account to provide information regarding the source. The same wounded women are filmed in the video, as is the distinctive square building in the background. A second video was uploaded to another Ivory Coast-registered YouTube account on the morning of March 4 at 09:06:37 GMT. The uploader describes it as “several women killed” at the “RHDP demonstration yesterday,” meaning March 3. None of these videos or corroborating photos exist before March 3, suggesting to a high degree of certainty this was the date of the event. The video itself was uploaded to YouTube on March 4, 2011. It‘s the earliest such video found on YouTube. However, it‘s highly likely the video originated from a Facebook account or elsewhere and was scraped onto this YouTube account. The YouTube account is registered in the United States and is linked to a defunct website, onemendo.com. The account appeared to be operated by someone with connections to Jamaican emigrants living in New York or New Jersey because the account contained promotional material for a local club, DanceHallReggae.com. Videos from around that time on an affiliated Vimeo account indicate they are based in Rochester, New York. An affiliated Facebook account also posts links to music by Jamaican DJs. It gives no further clues as to the origins of the video and did not post a link to it on March 3, 2011. Videos of a Senegalese soap opera were also posted to the YouTube account. The evidence above confirms the location and establishes the date of the video as highly likely to be March 3. However, to the central point: Does the video show women protesters being shot dead by the FDS on that day? Claims have been made that the killing is staged and bodies were placed on the street after the security forces drive past. These serious questions warrant investigation. In this statement, Gbagbo’s defense minister, Alain Dogou, referred to the emergence of this amateur video on March 4. He said a woman was instructed to “lay down, lay down,” (and we do hear this said in the video). Dogou said it is "difficult" to say" that the video is from the location reported by journalists. (Of course, we have confirmed the location.) He also said international journalists were not covering the protest because they were attending a news conference by UNOCI, or another event related to the Council of Ministers. Finally, he acknowledged that a Women’s March did take place in Abobo on this date. Why did the camera point away from the wounded for so long as the convoy entered the roundabout? Would all the victims be shot within meters of one another? Would they all fall face down as they have in the video? Their faces are quickly obscured by garments — why is this? A bloodied woman is told to “lay down, lay down” in the video, as described by Defense Minister Dogou. Why is this? Is this out of concern for her poor condition, or to stage an injury? The “massacre” creates a frenzy of emotion in the video; is this real? Or were other protesters duped by or complicit in a staged “massacre”? A doctor who has treated many women who did not survive said their injuries were clearly caused by heavy weapons, and not by bullets. The doctor and two witnesses at the scene told Human Rights Watch that the head of one of the victims had been completely separated from her body. Other victims, two of whom did not survive due to serious injuries, were injured by machine gun bullets. “There was a burst of machine-gun fire,” [the witness, Idrissa Sissoko] said. He also spoke of seeing six women being shot. “I saw six bodies lying there, suddenly,” he said. According to this report, a military source told a Reuters journalist that the shooting was an accident resulting from the nervousness of the security forces following previous clashes. We can say that the date and location are verified to a high degree. The original source is not, and we therefore did not get the opportunity to speak to the person who filmed the footage. Ultimately, though, does the video show what it claims? This we cannot determine to 100 percent satisfaction from a distance, and with the material that’s been gathered. Along with being able to contact and interview the uploader, it would be important to gather additional firsthand testimony from witnesses, doctors who treated victims, and the families of the reported victims. To identify those victims we could attempt a more detailed investigation of the first video, splitting it frame by frame at the key moments of the shooting to try and find ways to the identify victims, and then to track down their survivors. Even with all of the corroborating facts and information I was able to marshal, the verdict is still out on this video.